As we’ve discussed before, I have a problem throwing away glass containers. I just can’t do it! Jars and bottles accumulate in the laundry closet, which annoys my husband. I insist that I have a plan for them and keep them, anyway. I was so excited to show him these little creations the other day and demonstrate I really do have a plan for the jars I collect! 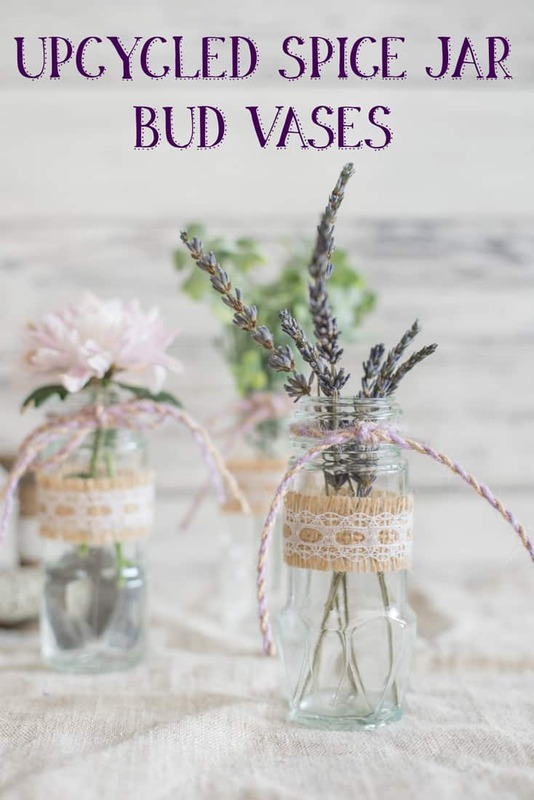 I really hope you enjoy this upcycled spice jar bud vase tutorial and that you’re able to repurpose some jars into virtually free creations, too. 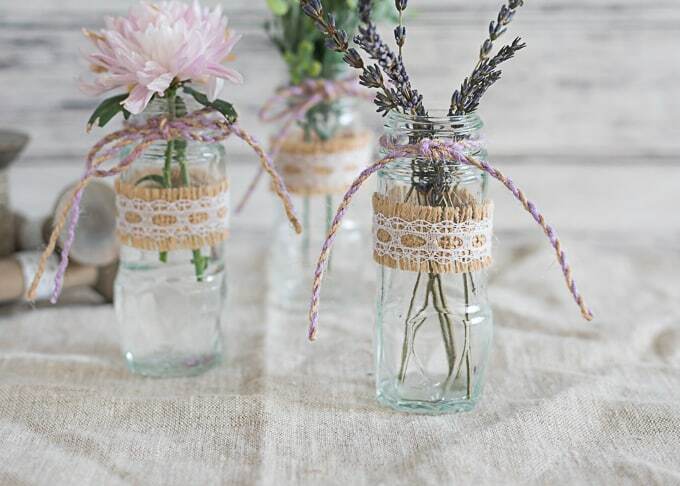 You don’t need much for the bud vases – just some empty spice jars and whatever you’d like to decorate them with! 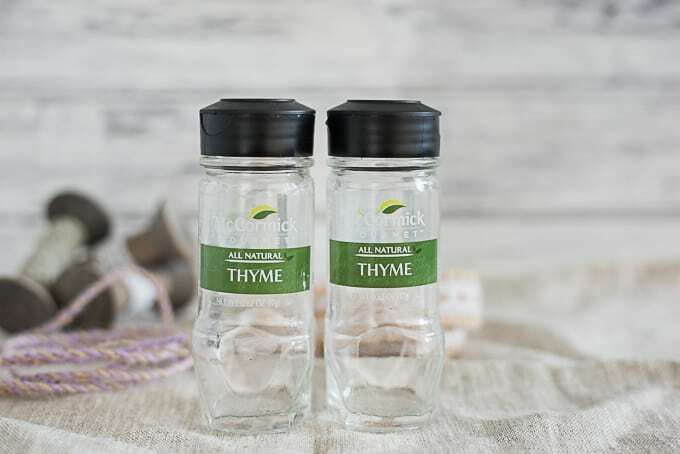 If you never purchase spices in glass jars, you can purchase empty spice jars at many craft stores and specialty grocery stores. I used burlap/lace trim and lavender twine for decoration. Lace, ribbons, or strips of cloth would look nice, too! 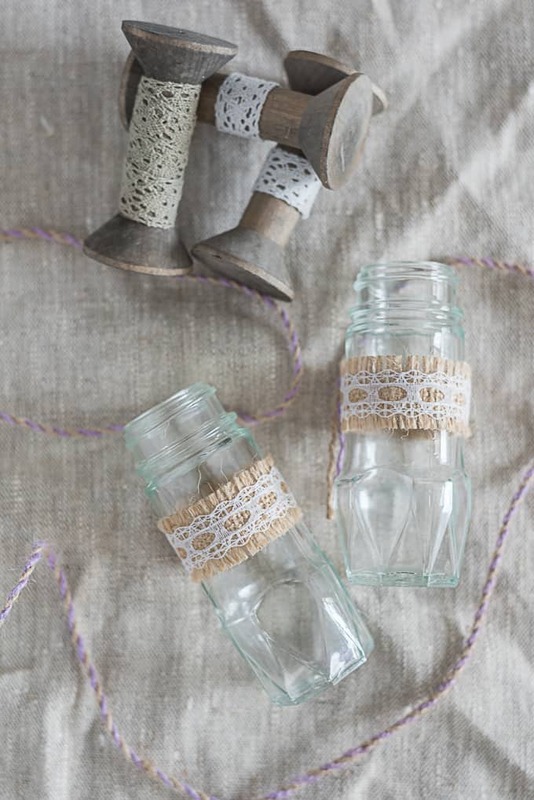 In addition to your jars and decorative trims, you may also need some adhesive. My favorite adhesives are Original Tacky Glue and high temp hot glue. 1. Make sure your jars are clean and remove the labels. Soap, hot water, and something abrasive (like steel wool or a scrubby pad) are frequently enough, but sometimes you may need a product like Goo Gone or some other solvent. Make sure to remove any residue from the solvent product, if needed. 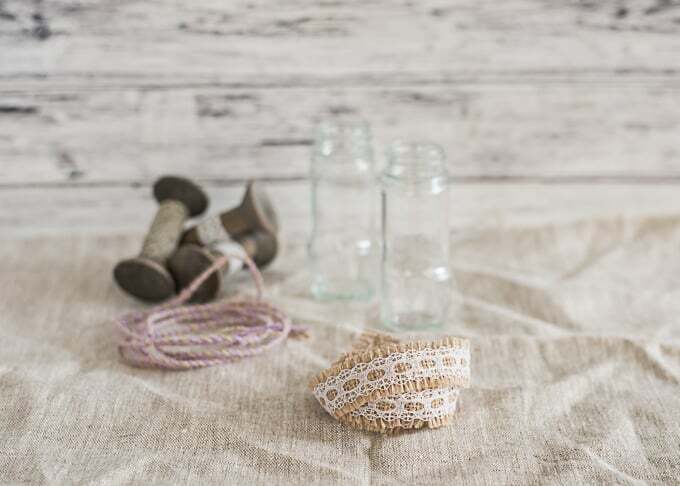 then tied a piece of lavender and jute baker’s twine around the top. 3. Voila! Instant bud vase. You can use these with a bit of water and live buds, like the mums in the photo; dried plants, like the lavender; or artificial greenery. I hope you enjoy your upcycled spice jar bud vases! I’m always surprised by the relative lack of cute spice jar projects I’ve seen online (maybe I’m looking in the wrong places?) I still have plenty of jars and I feel like we empty one at least every other week, so please let me know if you have fun ideas about ways to reuse them! 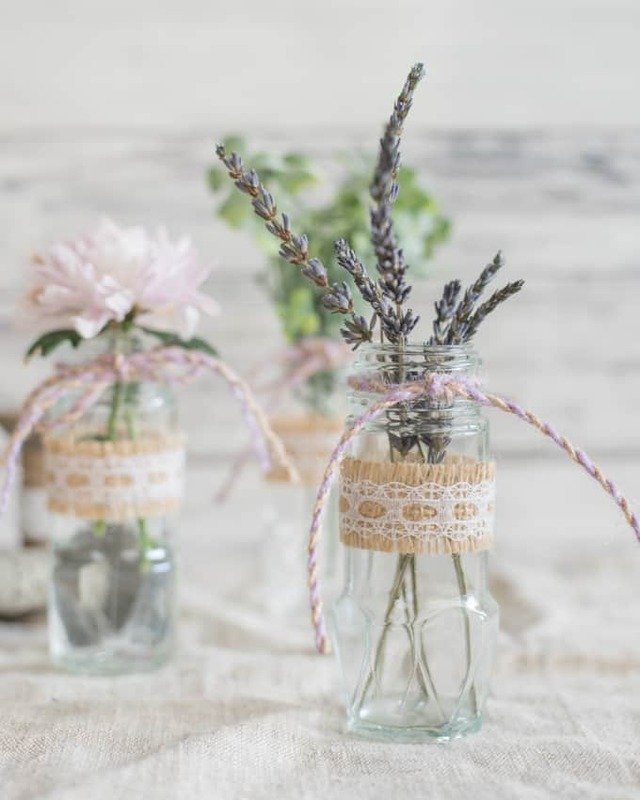 This upcycled jar vase DIY idea looks so awesome but simple to try. Think i could handle this. 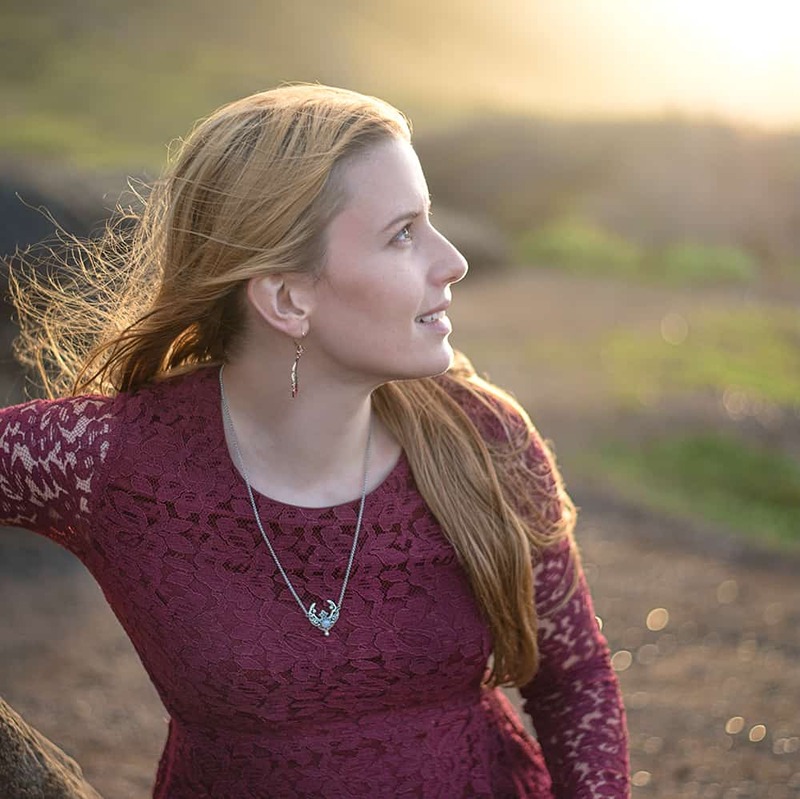 This is seriously so pretty! And great way to recycle !